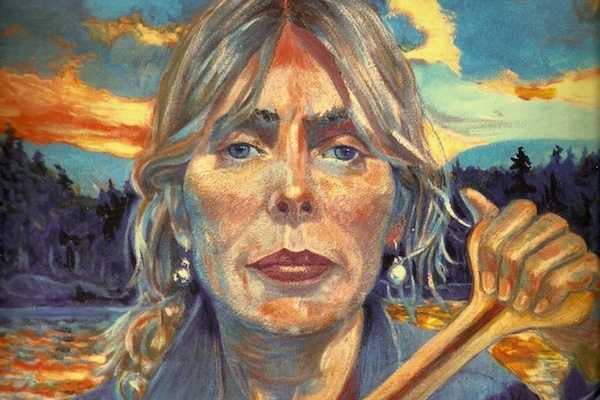 Joni Mitchell was interviewed on November 3, 1986. Joe was writing Off the Record–his oral history of rock and roll. Joe Smith was a longtime record executive and one-time radio DJ. From 1986-88, he interviewed more than 240 music artists and executives to write Off the Record. Then in 2012, he donated more than 230 hours of interviews on cassette tapes to the Library of Congress. People were very protective of me. Overly so. I was in the industry for a long time before I had any idea of what drugs people were doing. I mean, I just said, “Jeez, looking awful skinny. Why doesn’t he have an appetite.” I was very very sheltered when I first entered into it. I was young for my age. Not as naïve as they expected. I don’t know why I seem to bring that out in people. Yeah, I like my freedom. I like to do my own grocery shopping. People do recognize you. They are kind of shocked. Some people like it. It makes them feel at ease. It confirms their hopes that you are in fact similar to them. Some people can’t stand it. One time I sat down, we had good tickets on the floor at some rock concert. We moved in, we got there late. The fellow sitting next to me said, “You can’t sit here.” I said, “Why not? I’ve got tickets.” “But you’re Joni Mitchell.” I said, “So?” He said, “You shouldn’t be sitting there. You should be backstage, or you should be up in that box.” He was very annoyed. Some people are upset to see you doing ordinary things. Those people, if they were a celebrity, they would have an entourage. You know if you see yourself as a kingly type, then you need your serfs and your army and someone around you. I like to move around. I travel. I’ve driven across country by myself. When I felt that fame, people were nosing me out, well I moved on. I used traveling names. Wigs, if necessary. I didn’t think I had much of a following in the south. I thought I was anonymous down there so I kept to the south. I found in certain pockets that I was quite recognizable, and I just hit a wig store. At that time I was pretty much a. “Good Time Charlie.” I was a bad student in the school system. I failed the 12th grade. I had done my book reports from classic comics! I liked playing in small clubs. I really liked holding the attention of thirty or forty people. I never liked the roar of the big crowd. I didn’t like the sound of people gasping at the mere mention of my name. It horrified me. I don’t know how to sell out. If I tried to sell out I don’t think I could. By that I mean to make an attempt to make a commercial record. I just make them and I think if I was a kid I would like this song. So you have to have a certain amount of grab-ability, initially, and then something that wears well, that you’ll love for years to come. That’s what anything fine is. It’s recognized in painting. It’s not recognized … I’m just working in a toss-away industry. I’m a fine artist working in a commercial arena, so that’s my cross to bear. I have lost my credibility as a hit maker because of these side excursions into other branches of music by not being consistent. Consistency seems to be all important. Oh I would do the same thing in a minute. [crosstalk] never a minute of regret for that. You’ve been there. Are you kidding? Oh I don’t. No, I have no regret. Have you accepted the fact that you don’t sell more? Does it make you angry or frustrated? What I’m telling you is no it doesn’t make me angry. It makes me curious: Why? Do you ever get periods where nothing comes when you’re writing? Are there dry periods there, or are you prolific enough to keep writing? Well, musically, I would never run dry. Any time I sit down to an instrument, I could write a song. I try not to steal from myself, but the modalities create similarities. Musically, I don’t think I’d ever dry up. I trust my musical invention. Lyrics are hard. She had “it,” said Hedi Slimane, head designer at Saint Laurent, who named Joni one of his muses. Joni appeared as one of the faces of the fashion house’s ad campaign and she also landed on the cover of New York Magazine’s Spring 2015 fashion issue, proving that some styles are timeless. Read Joni’s awesome interview with in that issue. “I have always thought of myself as a painter derailed by circumstance.” Check out her paintings. Information surrounding the disorder is hazy, as it is not yet a widely accepted diagnosis. Some medical experts believe that it is in fact a psychosomatic illness. In the 60’s and 70’s, Laurel Canyon – a neighborhood of winding streets tucked into the Hollywood Hills off Sunset Boulevard in LA – was the center of the musical universe. It was where stars like Joni, Neil Young, David Crosby, and John and Michelle Phillips all lived, played, and made music. The music that came out of those hills even became known as the “Laurel Canyon sound” – folksy, melodic, and tuned in to the political and cultural leanings of the time. Joni paints a portrait of Graham Nash. Graham Nash wrote the classic Crosby, Stills, Nash and Young song about life at Joni’s house in Laurel Canyon.